1. Preheat the oven to 190°C, gas mark 5. Arrange the potato and onion slices and the thyme sprigs in a small roasting tin, and sit the pork on top. 2. Using a small, sharp knife, score around the circumference of each apple so they can expand during cooking. Place them around the pork. 3. Mix together the stock and vinegar and pour into the tin. 4. Roast for 55 minutes or until the juices run clear. Leave to rest in the tin for 5 minutes then remove any visible fat from the pork. 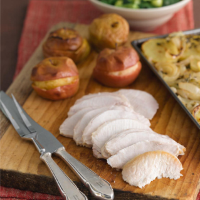 Carve the joint and serve the pork with the potatoes, onions, baked apples and steamed greens. Baking apples in this way brings out their natural sweetness. Next time you roast a joint, try arranging small whole onions around the meat for the last 30-40 minutes of cooking, or sit the joint on a bed of whole Chantenay carrots before roasting. Keep the water used for cooking any accompanying greens as a base for gravy.